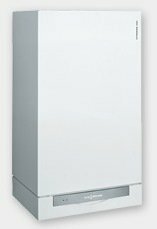 Viessmann Vitodens 200-W series is the most extensive group of all gas-powered boilers from this popular German manufacturer. It features the ultra-efficient boilers that are using the condensing technology which is contributing greatly in reduction of energy consumption and emission of greenhouse gases. The exclusive Viessmann features include the modulating MatriX cylinder burner made of durable and corrosion-resistant stainless steel that efficiently burns the gases with the low emission of greenhouse gases. The burner can use different gas type thanks to the Lambda Pro feature that allows the automatic adjustment to gas type and quality. Another element made of high-quality stainless steel is the Inox-Radial heat exchanger that together with the gas burner can produce hot water up to 96.1% efficiency. The combustion blower comes with the variable speed for the economical and very quiet operation. The system regularly performs an automatic self-calibration, even after a power failure, but if needed, it can be calibrated manually. The unit can also easily adapt to the outdoor temperature changes. The Viessmann Vitodens 200-W series consists of two groups; B2AH and WB2B providing models with the power output ranging from as low as 3.5 kW to high 155 kW. Some models can take advantage of the multi-boiler system which combines up to 8 boilers into one cascade system. This is how the heating system can operate with the high power of up to 1240 kW, making it powerful not only for residential applications but commercial as well. And thanks to the modulating gas burner the comfort in using the hot water is greater due to the reduced water temperature fluctuation. At the lower front of the unit, there is a new Vitotronic 200 control feature, HO1B, that controls the heating process and displays the useful info on the user-friendly illuminated graphics interface. It precisely controls and adjusts the water temperature, displays the operating and diagnostic details, and if there is a problem with the unit it uses the diagnostic system to help in troubleshooting by showing the fault messages. The temperature of boiler water for space heating and DHW can be adjusted from 68 F to 165 F and on WB2B-80 and WB2B-105 models to 176 F. The water is heated on demand and the maximum flow rate goes from 6.2 GPM to 35.2 GPM for the largest models. The boilers can also be combined with the storage water tanks. Viessmann boilers from Vitodens 220-W series can be installed almost anywhere inside the house; garage, basement, attic, kitchen, bathroom even the living room. This is possible due to boiler’s great venting flexibility and sealed combustion design. The boilers are using direct venting which means that the flue gases and combustion air are not in touch with the air from inside the house (exhaust pipe and air intake terminate outside). Vitodens 200 models are bigger than 100 series, while still offering great flexibility due to its wall-mount installation and installation option for almost any room inside the house. The flexible venting system allows venting pipes to run up to 180 feet, in horizontal, vertical and hybrid configuration, where up to four boilers can have a common venting. The units can also easily adapt to the outdoor temperature changes. Built tough, Vitodens 200 is made for a long period of service and is backed by the limited lifetime warranty.